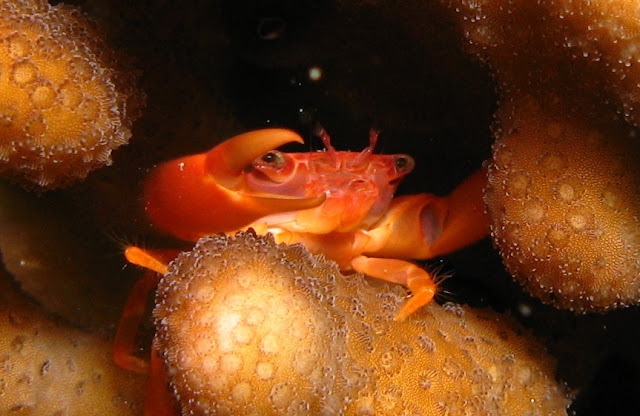 A Coral Crab: Not funny, but it is a type of -biont. BIOLOGY. Forming nouns denoting kinds of living organisms, especially with reference to particular modes of life, as halobiont, parabiont, trophobiont, frequently after adjectives in -biotic. The suffix -biont is quite specialised in all fairness, but I thought it might be of interest to those that write sci-fi. If you do, -biont may well be of use when naming your dastardly aliens that exist in weird and exotic environments. The churlish Alcobiont from the planet Bluton, for example, can only survive in an atmosphere of pure ethanol, making it perfectly at home on its frequent weekend visits to Britain. Or the abdominous Kebabiont from the planet Cholestron, surviving solely on the wares of the late-night fast food vans which, contrary to popular belief, are a common feature of civilisations throughout the aptly named Milky Way. Of course, you might also like watching David Attenborough or, y'know, reading books on real biology rather than making up stupid fictitious alien species. Either way is fine, of course, and -biont is a moderately interesting word for both pursuits. Bikinibiont from any planet which might conceivably support that kind of life. They are able to harness and metabolize latent attention. I won't describe the lifeforms at length but, believe me, they - look - fantastic! My first thought was a Predator in a bikini. I think I'm missing the point of a Bikinibiont.